2018-11-14 I haven't been operating portable recently (and likely won't for a while as it is in the teens now) but I have been operating almost exclusively QRP with my X5105 using one of my portable antennas, the past week or so with my recently completed 17/20/30/40 meter trap inverted vee. So that is almost portable! I've learned a couple things I think. One, QRP takes patience and persistence but with that you can get a QSO almost any time the bands are open and people are on. Distances for most QSOs are under a thousand miles but there are those occasions when you hit gold and grab one in Europe or some other location a couple thousand miles or more distant. Another thing is that CW, for me at least, seems most likely to get through. But it is not out of the question to have a SSB QSO every once in a while. In fact some of my DX ones have been SSB. I haven't played much (none with the x5105) with digital modes but I'm sure they would work well. Forty meters seems to be the bread and butter band. That is where I'm most likely to get a QSO. Thirty and twenty come through now and then. But Forty is most productive. I've not had a recent QRP QSO on 17 meters. Some of that is likely propagation but I think more stations tend to be on forty at any given time. It seems the most tolerant band of varied propagation conditions. SKCC stations are my most common contact. Seems like there is almost always at least one CQ SKCC caller on forty meters and they tend to be hungry for contacts and so will put up with less than ideal conditions. QRP at its best! Just add a key or mic, connect an antenna and you're good to go! An added benefit is that QSOs can be very short so the crazy swings in current propagation have less time to kill the QSO! Tuesday evenings and weekends when they have their sprints is the most productive time to get on. I generally don't find calling CQ very productive but rather respond to other's calls. Finally, with QRP it's not about the number of QSOs but the reward of each one! Further, you need to be happy with short QSOs which minimize the likelihood of losing the other guy mid QSO. Occasionally you can have a real rag-chew but don't be disappointed that they are infrequent. And when you manage to squeeze through a crack among the "big guys" piling on top of a DX or other sought-after station, kick back and have a good laugh. Another fun QSO is with another QRP station like I did just now with KB3ERI 600 miles east in PA. This time I was using my station G5RV antenna and the X51056's built in tuner. He was running a K1 at 4 watts to an end fed antenna. We had about a ten minute QSO. It serves as a reminder that not every "less than overwhelming signal" is because bands are poor. It just might be another 4 or 5 watt station. So give them a call. Savor each handshake and you'll be just fine! 2018-10-17 One of the problems with having a bunch of portable antennas is that you need to keep the cobwebs off them. You don't want them to become lonely and jealous. So after spending several days with my 17 ft vertical and 35 ft spiral wound vertical in the back yard, I decided to put up the 40/20 trap inverted vee. Both verticals gave me some good contacts and clearly are usable but I think they are truly compromise antennas and under normal conditions neither would be my antenna of choice. Having said that, the simplicity of the 17 foot wire one in particular makes it a great option if one is in a hurry and or in a very limited space. But verticals are noisy and I just tend to think resonant dipoles are overall better when possible. I used two 25 ft BNC terminated RG174 coax lengths joined with a female BNC coupler to connect the antenna to my Xiegu x5105 radio. Tuning around both 40 and 20 meters things were pretty quiet. I decided to tune to 14.060, the 20 meter QRP calling frequency, and have a try. Before I could hit the key, WU5M called CQ! He was reasonably strong, and guessing he was also QRP, I went back to him. He was about a 549 in here in Wisconsin and gave me a 579 in Texas. He was running a KX3 at 5w and a hexbeam antenna on a push up pole. I was using my x5105 at 5w to my trap inverted vee I had just put up on my Shakespeare TSP20 Six-Piece Wonderpole. We had an old fashioned Rag Chew that lasted 20 minutes, solid copy all the way! QRP and home brew antennas are fun! 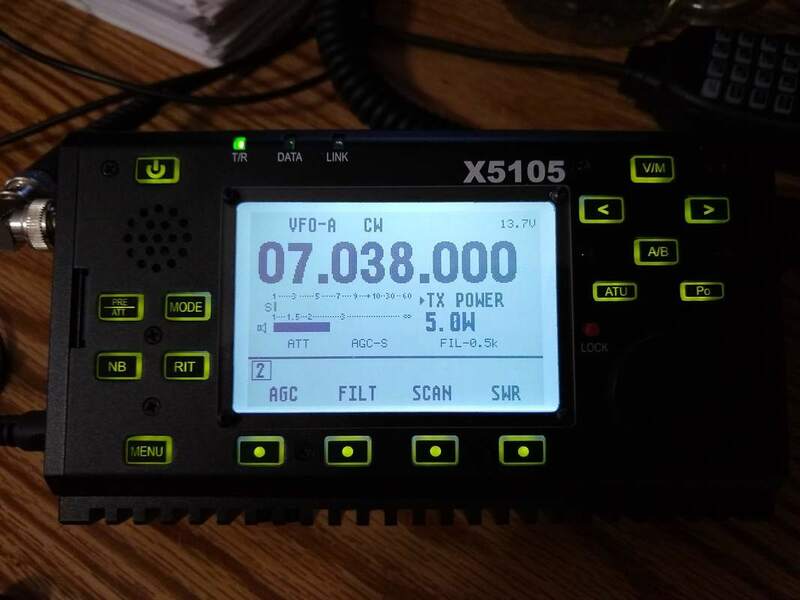 2018-09-08 After lunch today I connected my x5105 to my station G5RV and in just a few minutes I had recorded a 20 meter SSB QSO with W6H a Route 66 station in New Mexico. Then, tuning around I heard DJ5MW calling CQ SSB on 20. He had quite a pileup but I decided to be patient and persistent and got him! He gave me a 599 which I think was his routine but nevertheless he clearly got my info and I his. That was 4,445 miles at 5 watts! My day was made! 2018-08-17 I've been having lots of fun playing with my 35 ft antenna and FT817nd based portable station. I've managed a QSO or two nearly every day. Today was notable as my QSOs were SSB as I checked into the YL system on 14.332mhz twice. Once with the control operator in Alabama and the other with one in Ohio. The Alabama contact was touch and go but the Ohio one a couple hours later was solid. I used my Shakespeare TSP20 Six-Piece Wonderpole mast and was able to connect the antenna to the very tip of the pole twenty feet up. I get a rush from a SSB contact at five watts with a compromise antenna. I've grown to expect a contact using CW but SSB is a bit more illusive. Soon I'll be giving PSK a try as I've put all the pieces together for that. You can see more about that on my Ultra Portable PSK page. 2018-07-25 Today made up for the failure yesterday somewhat, though only in my back yard. I don't have a switch to replace the one that I broke as the pins are much closer together than anything in my junk box. I'm working on that. In the meantime I hard wired it with jumpers so the tuner works and since my FT-817nd indicates SWR I can work with it. So to the back yard I went with my 35 ft. antenna, Wonderpole and rig. It tuned up nicely on both 40 and 20 (didn't try any other bands as I had limited time). Forty was devoid of signals but twenty had a fair amount of activity. I tried the YL system at 14.332 but couldn't get the attention of the operator. Then I tuned down to the lower end and ad a nice 5 watt 559 QSO with AH6AX in Maryland on 14.052mhz. So once again the antenna, tuner and rig work. 2018-07-24 This afternoon I finally decided to head out to a local hiking place, set up my rig and try a QSO using my 35 ft end fed stealth antenna. So I walked in about a half mile or so to their picnic shelter, set up the antenna, got out the rig, battery and Tuna Tunah II tuner, connected it all together and, no signals or noise or anything. Then I saw it, the switch which switches from tune to operate position had broken so it was in neither position, thanks to the careless way I had put it in the bag with other things! Bummer! I had my 40/20 meter stealth inverted vee that does not need a tuner with me, but by then I was losing interest and just packed up, finished the two mile walk and came home. The lesson... pack carefully and look things over before you set up. Had I done that I would have just put up the inverted vee and been on the air. The good news is that setting it up, discovering it was damaged and packing it all away again only took 20 minutes! And I really did get out of the back yard!